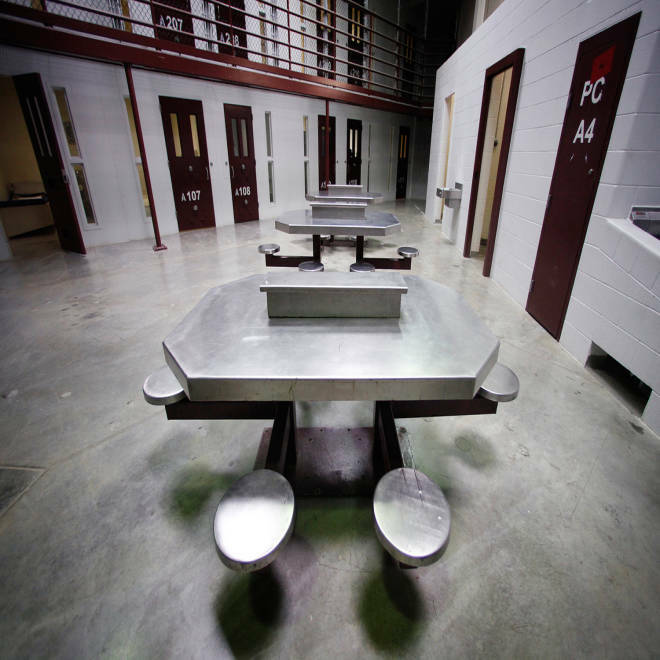 The interior of an unoccupied communal cellblock is seen at Camp VI, a prison used to house detainees at the U.S. Naval Base at Guantanamo Bay. The facility is operated by the Joint Task Force Guantanamo and holds prisoners who have been captured in the war in Afghanistan and elsewhere since the Sept. 11, 2001, attacks. WASHINGTON — A U.S. judge on Monday denied a Guantanamo prisoner's request to halt the force-feeding of hunger strikers and said that only President Barack Obama had the power to intervene. U.S. District Judge Gladys Kessler, based in Washington, D.C., said she would be overstepping her authority if she issued an injunction against force-feeding as requested by inmate Abu Wa'el Dhiab. Dhiab, a Syrian, is one of four prisoners, all of whom are hunger strikers, to make such a request. The court has yet to rule on the other three: Algerian captives Ahmed Belbacha and Nabil Hadjarab and Shaker Aamer, a Saudi prisoner with British residency. The four were rounded up during counterterrorism operations but were among the 86 prisoners cleared for release or transfer years ago. Obama came into office in 2009 with a goal of closing down Guantanamo but has run into opposition in Congress. The U.S. military holds 166 foreign captives at the detention camp on the Guantanamo Bay U.S. Naval Base in Cuba. Of those, 106 are on hunger strike, with 45 being force-fed as of Monday, according to a Guantanamo spokesman. They are protesting the failure to resolve their fate after more than a decade of detention. In reference to Obama, Kessler said in her four-page order that "there is an individual who does have the authority to address the issue." She noted that Obama had voiced concerns during a speech in May about the merits of force-feeding detainees, asking: "Is that who we are?" "It would seem to follow," Kessler wrote, that Obama had the authority "to directly address the issue of force-feeding the detainees." She also said that Dhiab had "set out in great detail in his papers what appears to be a consensus" that force-feeding violates international law. The Obama administration had argued the court did not have jurisdiction. Under federal law, civilian courts do not have jurisdiction to hear cases concerning the detention, treatment or conditions of confinement of any enemy combatant, Kessler wrote, citing a 2009 court decision. Government lawyers said the government had well-established legal authority to force-feed hunger-striking detainees. Jane Sutton contributed to this report.